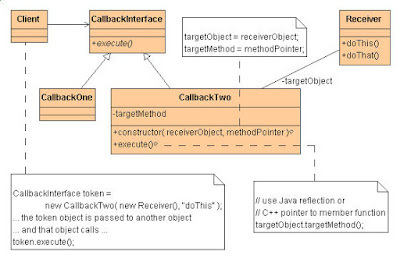 Hello guys, it's been a long since I have shared a Java design pattern tutorial. I did share some courses to learn design patterns but haven't really talked about a particular design pattern in depth. So, today, we'll learn one of the important design pattern, which is often overlooked by Java developers. Yes, I am talking about the Command Pattern which can help you write flexible, loosely coupled code for implementing actions and events in your application. In simple words, the command design pattern is used to separate a request for an action from the object which actually performs the action. This decoupling between Invoker and Receiver object provides a uniform way to perform different types of actions. This decoupling is achieved using a Command object, which is usually an interface with methods like execute(). The Requestor or Invoker only knows about Command object and doesn't care about the actual object which processes the request, which can be different. This transparency leads cleaner code on Invoker side and also enables the opportunity to do several smart things on the Command side. Your Command object can be as dumb as simply delegating the request to Receiver and can be as smart as recording the last command for performing UNDO and REDO functionality. The Command pattern ensures that your code is compliant with open closed design principle, the O of SOLID design principles, which means adding a new command would be very easy, creating a new implementation of Command interface and doesn't affect the Invoker code. Command pattern is particularly popular in GUI applications, where we use lots of commands e.g. Open, Close, Save, Cut, Copy, Paste, and corresponding UNDO and REDO operations. You can also see The Java Design Patterns Masterclass which not only covers command pattern and recently been updated to cover Java SE 8 as well. Before going further and implementing a command pattern in Java, let's get familiar with the terminology used in this pattern. Here is the UML diagram of the Command Design Pattern, which will make things more clear. 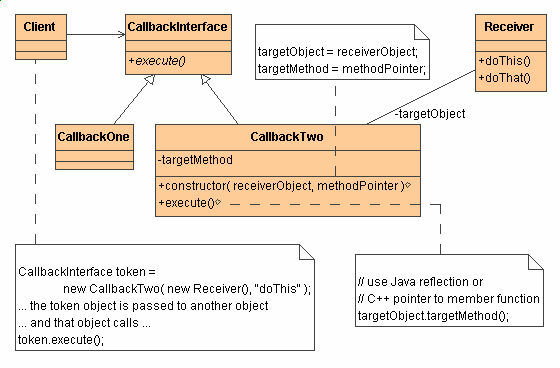 You can see that Client has a reference of a CallbackInterface which has a generic method execute(). The individual commands implement this interface and provide an implementation which is nothing but delegating to the actual object for doing things. The important thing is that the client doesn't know about Actual object which is performing an action on behalf of those commands. This decoupling results in flexible code and makes it easy to add new commands without impacting client code. This is possible because of the open-closed design principles which make the code open for extension but closed for modification. If you are curious to learn more about this principle or in general SOLID design principles, I suggest you take a look at the SOLID Principles of Object-Oriented Design course on Pluralsight. One of my favorite course and I highly recommend it to every developer who wants to write better, flexible and clean code. Here is our sample program to demonstrate how to use the command pattern in Java. * Java program to implement Command design pattern with example. You can see we have created two commands Create and Delete by using Command pattern. It's one of GOF pattern as well. You can see Command is an interface and both CreateCommand and DeleteCommand implement that interface and implements execute() method to put the logic of what command is supposed to do. Knowledge of design patterns really helps to write more flexible and better code and if you also feel like that I suggest you go through all object-oriented design pattern at least once. 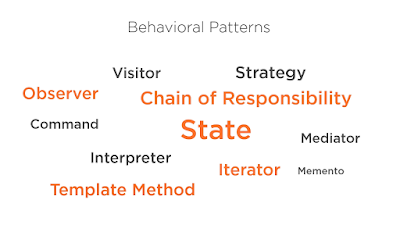 If you want an online course, I suggest joining the Design Pattern Library course on Pluralsight It provides the best collection of the object-oriented design pattern. One of the best way to learn and understand design pattern is exploring as many real-life examples as possible. Seeing, how a particular framework like Spring, project or library uses a pattern helps to develop an insight required to identify use cases, where a pattern can be applied. Recently, I have also shared, how I learned template method pattern and a couple of design principles from Spring farmwork on my post 3 things Java developers can learn from Spring to write better code. Whenever I learn a new design pattern, I always look in core Java library for it's used. Since every Java programmer uses JDK library daily basis, chances of connecting to an example are more than any random trivial example. Two of the Command pattern examples from JDK are java.lang.Runnable and javax.swing.Action interface. If you look closely you will find that Thread Pool executors are invoker of Runnable commands. As we have seen in this article, the main benefit of using Command pattern in Java is decoupling Invoker of a command from the object, which does the actual processing. By decoupling them and using introducing Command object, we create a design which can keep track of every state changed via Command objects. 2) Decouples clients from an object which actually process the request and provide a uniform way to perform a similar task. 3) Since Command pattern encapsulates request, It can be used to record state, implement Undo and redo functionality, Queuing a request etc. 4) Command Pattern makes it easy to add new commands. It also follows the Open Closed design principle, where new functionality is added by creating new code. Since request processing is transparent to Invoker, adding a new command doesn't require a change on their side. Btw, so far. 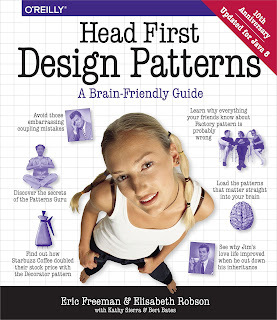 I have suggested some nice courses to learn further about design patterns but if you like books you can always see the Head First design pattern 2nd edition for more real-world examples of the command design pattern in Java. One of the best book to learn object-oriented design patterns, which is also now updated for Java 8 to implement those patterns in a better way. Like any other design decision, Command pattern also involves tradeoffs. If you have a lot of commands, just like in a major GUI application like popular Java IDEs like Eclipse or IntelliJIDEA, you might end up with lots of small command classes. Though similar functionality can be grouped into a couple of classes with each method performing a task for a particular command. By the way, using Command pattern result in readable, maintainable and extensible code, so this cost is worth paying. That's all about Command pattern in Java and Object-oriented programming. Use Command pattern to encapsulate request processing and separating invocation of a method from the object, which actually processes that request. The Command design pattern can also be used for doing smart things instead of just delegating the request to Receiver, e.g. you can record and queue up the request for processing, can perform undo operations and can perform pre-processing operation e.g. logging request for auditing etc. Thanks a lot for reading this article so far. If you like this Java design pattern tutorial then please share with your friends and colleagues. If you have any questions or feedback then please drop a note. Does command pattern has a real world usage in finance and insurance domain? I see it is more useful to implements command and action hence more suitable for game programming domain, and particularly in GUI application.